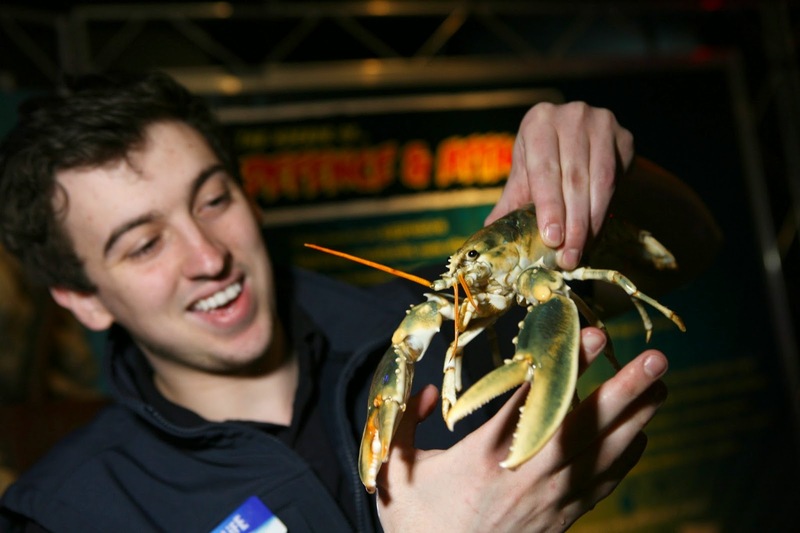 A new army of crustaceans, CLAWS, have touched down at Sea Life, Manchester from faraway Paris just in time for the Easter holidays. I was pleased to be one of the select few invited to attend the opening of this new exhibit. As the name suggests, CLAWS is all about animals with claws and shells. 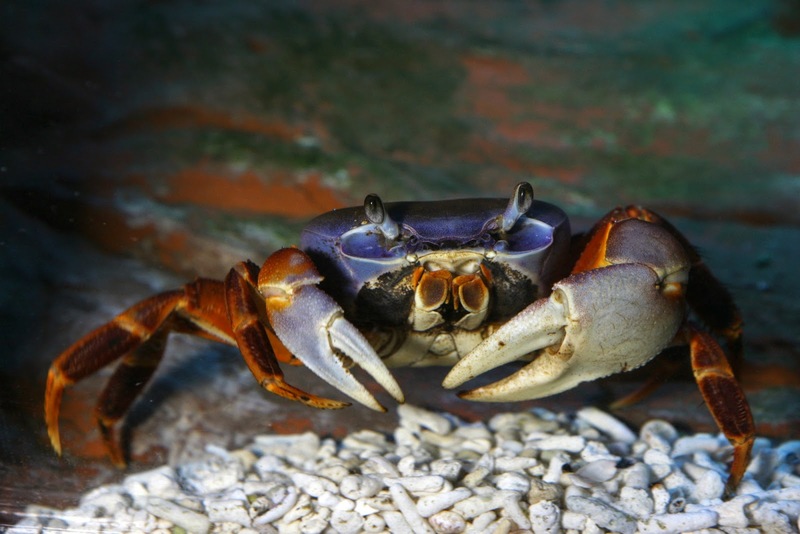 From a variety of crabs to shrimps, the exhibit also brings to the UK, Claude, a giant Tasmanian crab from Australia who is predicted to weigh a whopping 13.5 kg when fully grown. As luck would have it, Claude was caught up in an immigration mix-up at Manchester airport and was in quarantine when we went visiting Sea Life. But all his compatriots had made it through airport security, and were snuggly housed in their new Mancunian home, ready to receive visitors. Aquarist Joe Lavery was on hand to guide us on our tour of the exhibit. We were introduced to the strikingly spectacular Rainbow crabs, so called because of their vibrantly coloured shells. I was struck by how still they were in their new habitat; for a moment I thought they were plasticine models and not live at all! Next up was a very rare albino lobster. They are apparently 1 in a 100 million, so it was quite something to actually get to see one. We also saw a shy mantis shrimp who insisted on curling up in a crevice in his rocky home, away from prying eyes. Hermit crabs, so called because they carry their own mobile shell homes on their backs, were a more social lot. A particular one kept going around his enclosure, scurrying first in one direction then the other. There were lots of plaques along the walls of the CLAWS exhibit providing snippets of information about all things crustacean. One particular exhibit was more hands-on, literally. There was a lever you had to pull to make a pair of giant claws snap shut. J had a go, I had a go and couldn't budge the lever. It was to demonstrate the force with which a crab's claws can snap shut. Ouch! I can't begin to imagine the pain if my finger got caught in that kind of force. Our visit to Sea Life was not all about the CLAWS exhibit. 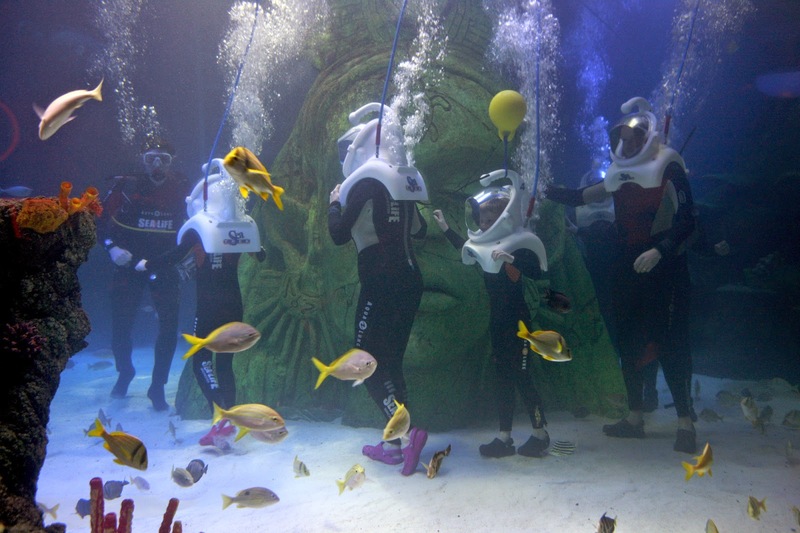 Prior to being introduced to our new arrivals, we had the opportunity to do the Sea Trek, a novel underwater experience offered by Sea Life Manchester. Kitted out in wet suits and with a giant bubble helmet balancing on our shoulders, we climbed down 12 feet to the bottom of the enclosure housing sharks. Not great whites, thank goodness. Never having done any underwater work apart from in a swimming pool in all my life, I was quite apprehensive to begin with. I was also petrified about my ears popping and bursting. I really should not have worried. As long as you are healthy and follow the instructions detailed out in the pre-dive briefing, you are more than likely to be fine. It was wonderfully thrilling to be within touching distance of all kinds of marine life, including, but not exclusively sharks. There were a variety of fish and turtles. The colours, the textures, the detail was so worth my initial trepidation. They seemed completely oblivious to our presence, and went about their business in an almost nonchalant manner. Never have ten minutes of my life passed so quickly. It was an experience I will always cherish. It has emboldened me to expand my horizons and perhaps take on a few more adrenaline-infused challenges, both above and below water. At 4 years old, J is too young to have accompanied his parents on the Sea Trek. But it was a remarkable day of firsts for him too. Ernie the Turtle, the Sea Life mascot came to visit all the children. J, who normally steers well clear of anything or anybody in costume, rushed to give him the biggest hug ever and would not let go. He would have happily monopolised Ernie for the rest of the evening if we had let him. No idea what sparked this reaction, but I think I know what to get J if ever he asks for a pet. It will most certainly be a turtle. Disclaimer: We were invited to preview and blog about the CLAWS exhibit at the Sea Life Centre in Manchester. All opinions are my own. Sealife centres are amazing. I think maybe I should do this and get over my phobia of crabs! It looks really interesting. How amazing to get inside the tank! I love Sea Life Centres and especially sharks but I would want to get too close to one of them! What a great sounding day out - I've not been to a sea life centre in ages but I used to love it. Looks like a lot of fun - Hope they come to our local sea life centre soon.